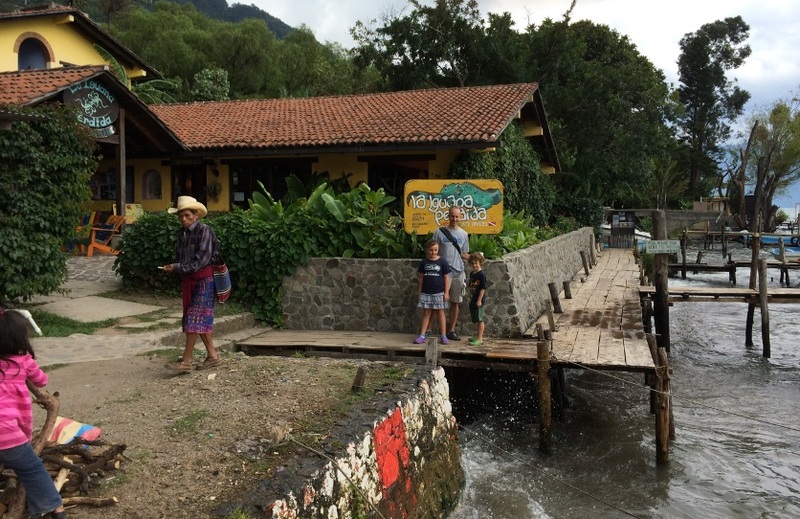 One of our favorite weekends here was a night we spent at La Iguana, a small lodge on the shores of Lake Atitlan in Santa Cruz. Our trip started with a 15 minute boat ride, always fun in my book. We dropped our bags at La Iguana and took the Batman tuk-tuk up the hill. We arrived around 3 pm. 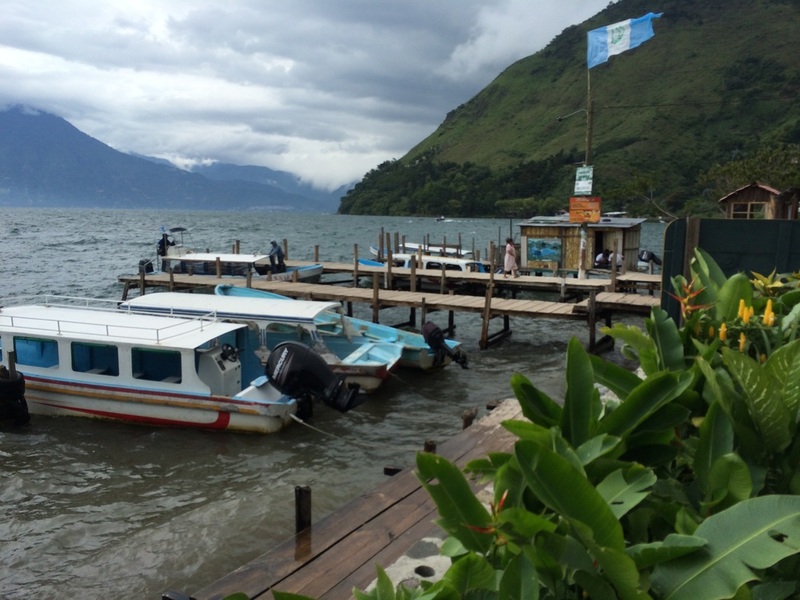 Lake Atitlan is pretty choppy in the afternoon. Looking at the boat dock from the dock of La Iguana. Tag and Elle had quite the discussion about which tuk-tuk we'd take. We checked with La Iguana's front desk to find out what we should pay before got in. It was a good thing. The driver tried to tell us it would cost more on the weekend, but we knew better. At the top of the hill, we stopped at the only restaurant that appeared open, and were met with surprise and admiration. CECAP is Santa Cruz's vocational education center. CECAP is funded by the Amigos de Santa Cruz Foundation, which just happens to include The Seattle Foundation. Because Santa Cruz is considered one of the poorest 45 townships in Guatemala, it has come to the attention of do-gooders who invest in it in order to break the cycle of poverty. CECAP focuses on primary and secondary education, culinary skills, some computer skills, sewing, carpentry, welding and foot loom weaving. Ken and I had a beautiful and healthy vegetarian lunch and the kids ate some homemade fruit roll-ups. CECAP Restaurant is the yellow building with the turquoise sign. We ate in front of the top level of windows and enjoyed views of the lake with our lunch. My healthy salad with black beans and tostadas. This is one of the best salads I've seen in Guate. We walked around the town and met a few of the locals. Everytime we explore new towns, especially on foot, I can't help but feel giddy. I'm constantly thinking about what an amazing adventure this is and how lucky we are to have broken our mold. Every town is different, yet many aspects are the same -- little tiendas (shops with soda, chips, candy and other foods), a town square and houses. After taking their picture, the kids hounded us until Ken gave them a quet (12 cents). The Coke vs. Pepsi Challenge is ongoing in Santa Cruz! We don't really know if this is the town square, but it's our best bet. This appears to be the town's big church, the school and a basketball court. We walked down the hill enjoying more of the scenery and the pleasant weather. Of course the kids wanted to take a tuk-tuk back, but we were having none of that! Here's the road connecting the town center of Santa Cruz with the boat dock. Notice the wall. The next two pictures show the project of reinforcing this wall. 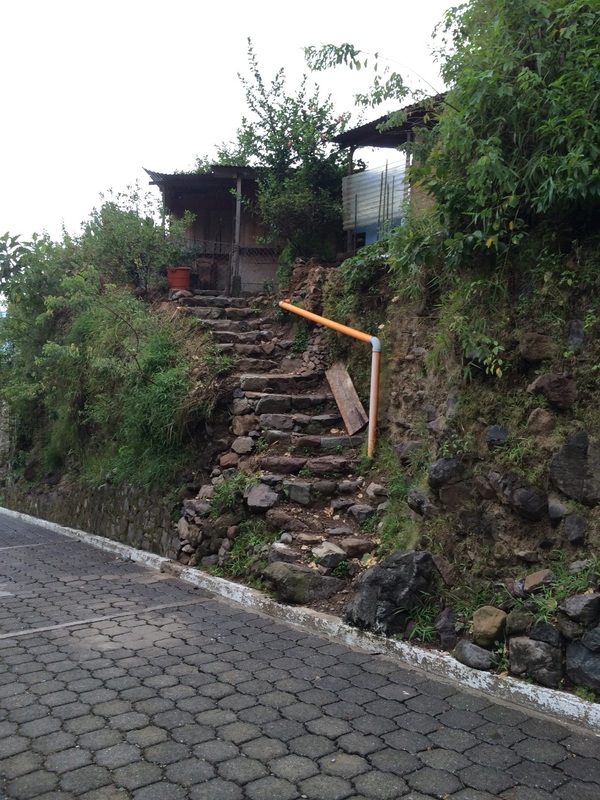 This is how Guatemalans do scaffolding.The scaffolding will be raised as needed. Another shot of the scaffolding. Although we took this trip two months ago, this image has stayed with me. This is someone's walkway. 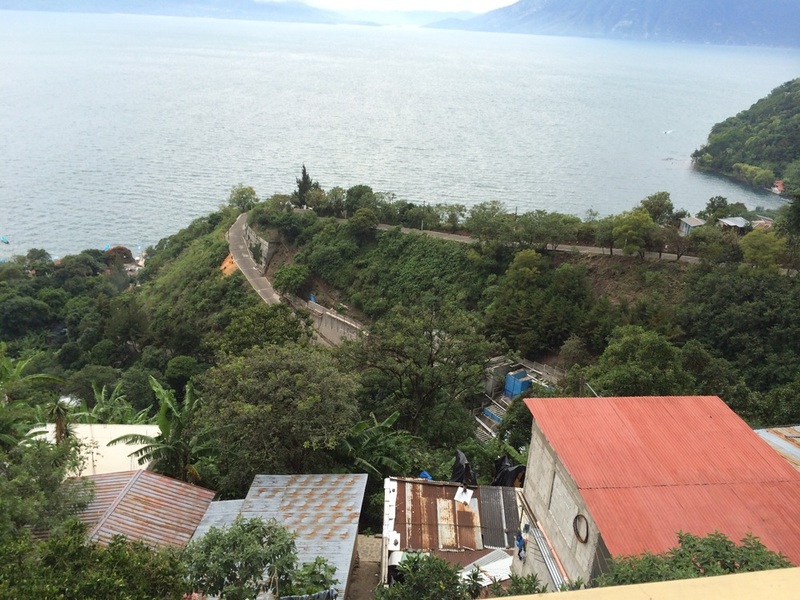 The house may be decrepit and pieced together with recycled materials, but their view of Lake Atitlan is breathtaking. Taking a moment for a family pic to capture the day. Once again, we can hold Tag in the picture, but we can't make him smile. Back at the hostel, we relaxed and waited for the communal dinner. We had to make dinner reservations in advance. We'd be hard-pressed to find another option if we hadn't. In fact, the kids were hungry an hour before dinner and I bought the last piece of watermelon from a nearby tienda. When Ken went back to buy another piece, the senora refused. She preferred to save it for the next day when she was likely to sell several pieces. Therefore, Ken bought the entire watermelon, and we shared it with friends. A little cuddling and wrestling on the couch back at La Iguana before it's dinner time. A window in the guy's bathroom. Using recycled materials for windows like this is not uncommon. The Hobbit House at La Iguana. Guests are welcome to build a fire in the house and enjoy a traditional steam. The kids liked playing in it. I was able to raid La Iguana's book area and found some different books to read to the kids that night. Fresh books are such a treat. Since it was Saturday night, it was "Fancy Dress Night". We had no idea what this meant until the party started! La Iguana has a small room full of women's fancy dress clothes. Most of the 20-somethingish guests borrowed clothes and wore them for the evening. Yes, a nice cross dressing evening and I'm not sure our kids even noticed! BTW, La Iguana infuse their own vodka and the lemon ginger one was fantastic. Tag's first appearance in a band. He's playing a singing bowl. The owner of La Iguana and his friends played music, and Tag was part of the band for a couple of songs. It was a great evening and we retired to our room exhausted. Stay tuned for Day 2 in Santa Cruz.